Spacious 1-bedroom, 1-bath ocean condo with large lanai that has its own private entrance! Escape the crowded resorts and opt for a more peaceful atmosphere at Kihei Resort. The master bedroom has a Sealy Plush Queen Comfort Top bed the living room has a Queen sofa bed. Split Bathroom Vanity allows one person to use the sink while another takes a shower. Brand new front-loading washer and dryer are a definite time saver! This unit has an A/C unit, plus a brand new HDTV and Smart Bluray player (complete with Netflix, Pandora, etc. capability)! There is a wonderful area just adjacent to the unit, with tables and BBQ grills, perfect for grilling your favorite island fish while enjoying the fresh Maui breezes. The pool area includes a hot tub and ample seating for your enjoyment. And did we mention FREE WIFI and FREE PARKING?! 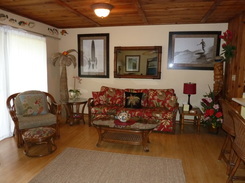 Tropically decorated 1-bedroom Tommy-Bahama style condo on the ground floor in Building 3. Overlooks Koa Resort's lush tropical landscaping.